During the trips to China we have visited few places there. However those places were always nearby Xi’an as my dear wife turn into a role model couch potato once she arrives in her parents apartment. Usually the only means to get her away from the beloved sofa and TV are either restaurants or animals. 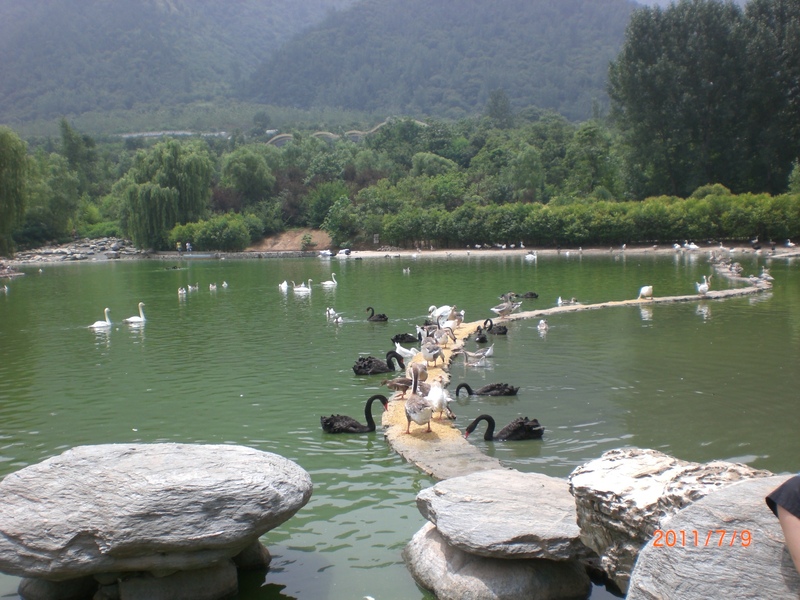 In this case animals worked as we manged to even go twice to the Qinling Zoological Park. It was pretty exciting for me there the first time as I just love good Zoo’s. This one even offered some kind of safari tour in which you sit in the back of a truck with metal bars around to be protected against more dangerous animals. Of course I wanted this tour as I never had experienced something like that before. At the beginning of the Zoo is even a little theme park. My in-laws offered that we go there however it didn’t look too safe in my opinion and I was pretty much right about it. Why you may ask well, a couple of years later there was an accident at the theme park with three people injured. Of course this could happen in any theme park but when I see that the amusement rides are full of rust and some parts fell already off I just don’t really have the urge to try it out myself. After the safari tour you can start the normal tour and go around following the many paths. The map you get with the tickets give a nice overview where to find what animals as otherwise walking around the whole park surely takes nearly an entire day. Now we come back to the Giant Pandas. Everywhere is advertised that there are Pandas and not only I wanted to see them but the rest of my Chinese family as well. You can imagine our disappointment when there were no Pandas in the enclosure! Now, this could have been just coincidence, perhaps they were somewhere else on that day but no. When I was there a year later there were again no Pandas and reading several reviews it seems that barely anyone has ever seen them there. You know what? Even though I just love Zoo’s and this one has a huge variety of animals it is definitely not my favorite one. For one, everything appears to be in a bad condition as if nothing has been really maintained for years. All over the park you can see these kind of things. From rusted amusement rides for the children within the park (not the theme park in front of the Zoo) over dried out water areas to buildings with huge cracks and holes in the roofs! I haven’t been in any other zoo’s in China yet but I really hope this is not the norm. I mean this park has many positive reviews from Chinese but many bad ones from foreigners. I don’t want to say the park is bad as it offers a nice day trip away from the city however I would not recommend it as a main thing to see when visiting Xi’an as there are many other and better things to see. In case they would really start taking better care of the entire Zoo in terms of actually repairing broken things, make it look more inviting including improving the animals enclosures I will definitely go there again and perhaps then recommend it but not right now. What are your experiences when visiting Zoo’s? Have you ever been in a Chinese Zoo? From comments left on TripAdvisor, there was 1 panda in May 2013 but now there are none. Some of the photographs showing pandas look to me remarkably similar to photographs of pandas at zoos in Hunan. Whether they exist I have no idea. As to the claims on the internet that they exist by travel agents, government agencies etc., my experience is that people duplicate much of the information from each other’s web site without making any effort to check the information is correct or just plain nonsense. Most of it is totally inexcusable in my opinion. 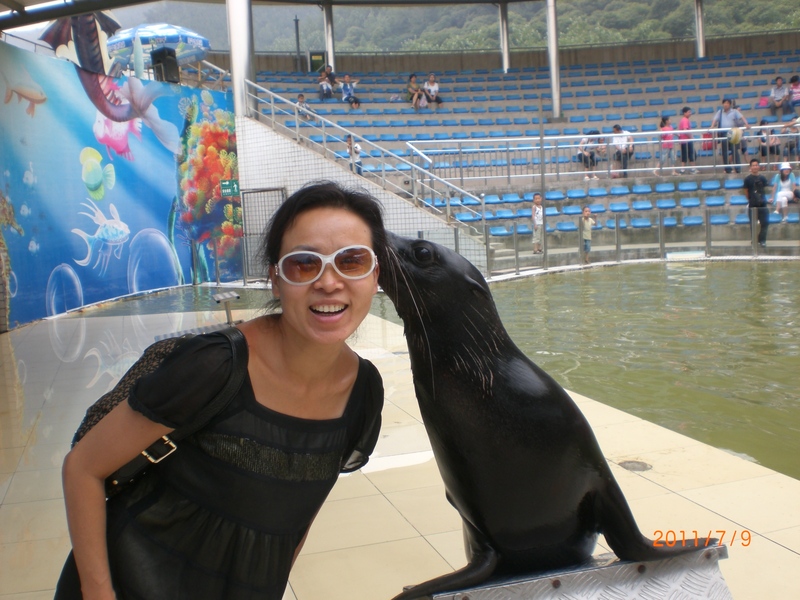 I have never been to a zoo in China but I have been to the Taipei Zoo on several occasions. The zoo in Taipei seems to be very well kept and there are pandas there. I haven’t been there since the pandas arrived but I have seen many pictures taken of them by my friends on facebook. There is also the famous baby panda, Yuanzi, that was born there. I think you did the right thing skipping the rides – if they look unsafe, then they probably are. Me, too! When I was younger, nothing really scared me! Fast forward to now and you have a different story. Yes, I think Taiwan is pretty clean and as for the food scandals, that is just a result of greedy business owners. I just came back from visiting Melbourne Zoo today. It was a small zoo where you can see everything in 2 hours. Today, though, some of the animals came jumping out so it was quite exciting. I have never been to a zoo in China but that zoo can’t really be as bad as it sounds! The safari ride sounded very fun and very glad to hear MIL didn’t jump out of the vehicle as you passed the animals..or maybe she did 😀 Where there any monkeys there? Yes there were monkeys and MIL and many other Chinese were making weird sounds. In Europe I know that some children try to imitate the animal sounds but here those people were all adults and they made cat sounds for monkeys etc! That’s a first I’ve heard, that visitors to the zoo including MIL imitating the animal noises 😕 I am sure that didn’t make the animals come closer to her. I would be surprised if it did. It always fascinated me no one simply held a banana in their hand (just holding, not feeding) when visiting the monkey enclosure at zoos. No pandas in a Chinese zoo!!!! Egats. What in the wide world is going on? Honestly, I think this is because they loan them to other countries. For example, http://en.wikipedia.org/wiki/Chiang_Mai_Zoo – CM’s zoo had a 10 year loan on a couple of giant pandas. All my students knew the pandas names, etc. There was even a TV channel where you could watch the pandas (specifically, the baby one), too. Ah, that’s too bad. I also love zoos, and I try to go to one whenever I am somewhere new. I’m always sad when I see a zoo where the animal habitats are in sad condition. I went to the zoo in Ueno before and it was a good zoo (it’s highly rated on Japanese zoos in Japanese), but I still felt like some of the animal habitats could use an upgrade. It’s disappointing to go to a Chinese zoo for pandas and not see any pandas. However, they are expensive to take care of, so a lot of pandas are shipped to overseas zoos. If you want to see pandas, I recommend the San Diego Zoo in California, in the US. They always have pandas and the pandas are usually on exhibit. They also have a breeding program and so lots of baby pandas. I have been to the zoo in Beijing and it wasn’t in a great state. There are pandas (you have to pay a separate ticket to see them) and they are boring, they basically just sleep all day. My boyfriend told me the zoo in Suzhou is in quite bad condition. I like going to zoos. It’s been a while though. My favorite part is getting to interact with the birds and feeding them. I really want to see pandas in China though. 😦 It’s sad to hear the zoos over there are not in the greatest condition. I’m afraid zoos in most of China are about the same. 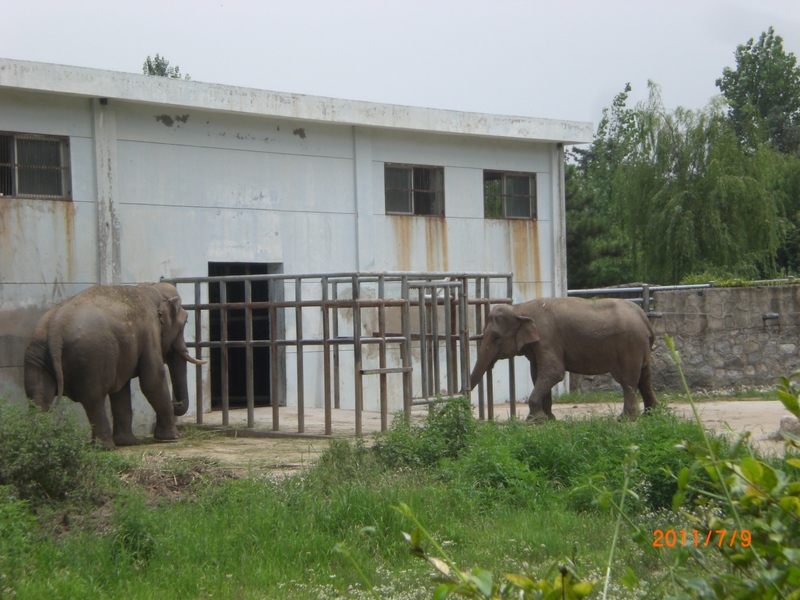 I’ve visited the Xining zoo and it was depressing. I mean they have some cool animals, but the conditions that they live in are pretty depressing. I never went to the Beijing Zoo because I was afraid of what I would find. In the bigger cities the zoos might be better. I am looking forward to visiting any zoos around Shanghai, I think they might be better maintained. Glad you got your family out and exploring. That’s always a good thing. I didn’t find the condition of the Beijing Zoo that terrible (not so different compared to my hometown zoo in the States), but what was terrible was the utter lack of etiquette of the patrons. They were banging on cages and people were feeding the zebras cookies. I didn’t know whether to laugh or cry! Yeh zoos are a bit woeful in China…. for sure. Many are concrete, not an inch of green and the animals look sick. The panda reservation in Sichuan is amazing though!